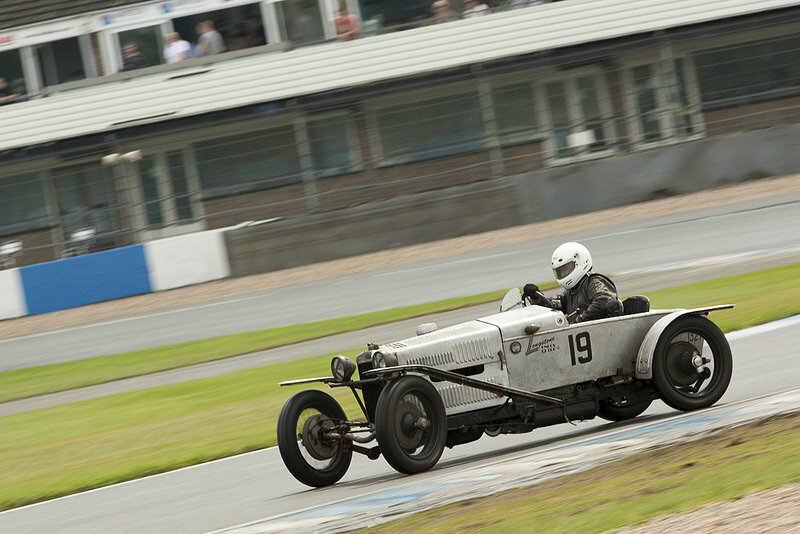 The 19th of July saw another wet days racing for a VSCC event, as the series moved to Donington in Leicestershire. In recent years the event has taken place at Mallory Park, but uncertainty over the circuit has meant that a change of venue was needed for this year’s meeting. The heavy rain meant that I wasn’t able to use the Mamiya C330F, and as I had another event to photograph with it the next day (post coming soon) I wanted to keep it dry. Instead, I took the Canon 5D MkIII out, with the 70-200mm lens and the 1.4 convertor. I’m not usually a fan of using the convertor, but with Donington being a rather large track it was a must to get any usable shots. The chicane at the end of the circuit is always a good spot to go to, especially in wet conditions where cars slide around in the wet. Robert Carr at the wheel of the AC/GN Special fought with the back end as he tried to get the power down through the twisty turns. Robert Carr racing through the wet chicane at Donington Park in the AC/GN Special. A great sense of speed with a shutter speed of 1/20. With a shutter speed of 1/20s the image really showed the feeling of speed as these cars race past onto the start finish straight. As part of the Bob Gerard Memorial Trophy event, a selection of Edwardian racing cars took to the track. These machines have to be seen to be believed, with their huge engines, very long steering columns and complete lack of bodywork. 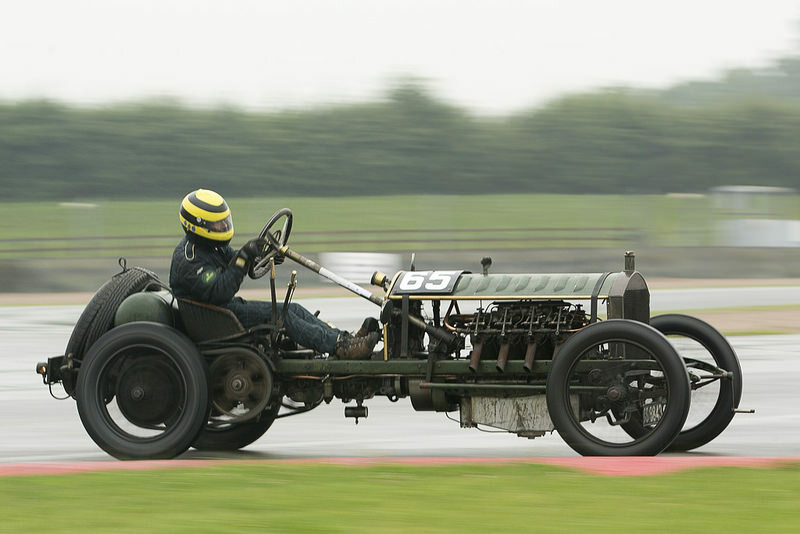 Duncan Pittaway in the Edwardian Monarch Special races through the wet chicane at speed. These cars always provide a certain kind of spectacle when they race – although the pace may be a little more sedate, being able to see the driver operating all the different controls more than make up for lack of speed. In the early afternoon the conditions were substantially better, with the sun coming out to dry the track to an extent. As the racing started and the drivers began to push, there were plenty of powerslides and off track excursions. Dougal Cawley in Piglet getting very sideways out of Redgate corner. After a long absence from the championship due to engine problems, it was great to see Dougal and Piglet racing again, and getting as sideways as you would expect from a member of the ‘Chain Gang’. 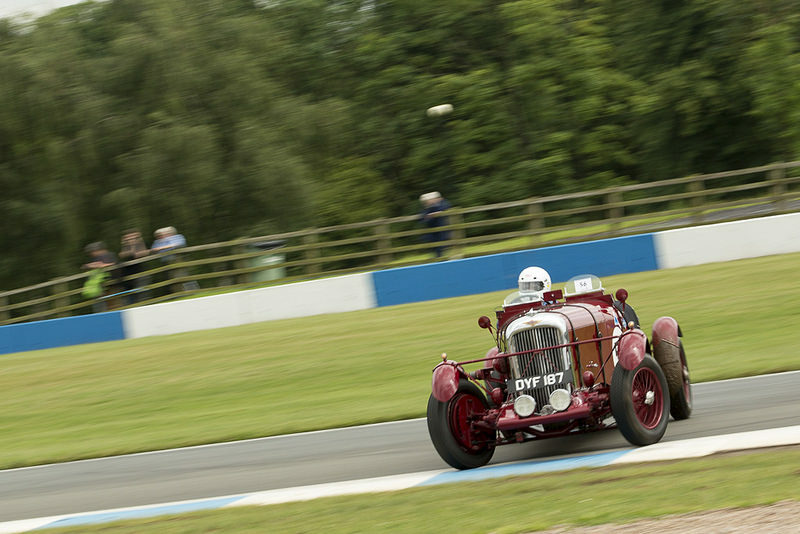 The beautiful blue R4A driven by Nicholas Topliss races down the Craner Curves at Donington, with the building creating an Art Deco-esque background. The background here adds an extra level of depth, with the shapes running through the photographs with the lines of the car. 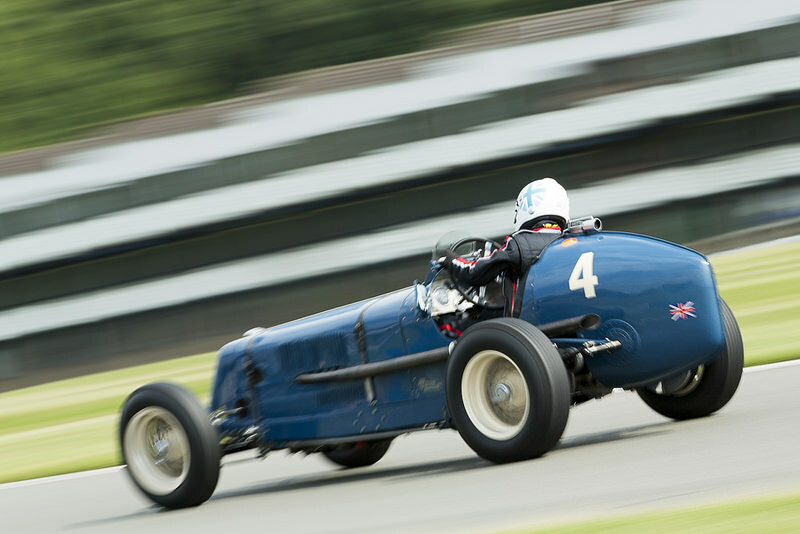 A shutter speed of 1/60s has kept the driver sharp, but the rest of the car blurred as it races past. With the changeable conditions inevitably came a series of spins and off track excursions. The large Lagonda LG-45 of Richard Reay-Smith had one such moment coming out of Redgate. The big red Lagonda LG-45 of Richard Reay-Smith spins on the wet kerbs coming out of Redgate corner. Half way through the penultimate race, there was an almighty thunderstorm – luckily I was inside the media suite when the heavens opened. The single seater Formula cars were out on track at the time, and despite visibility dropping to about 50 meters they somehow all made it back to the pits. The race was of course red flagged, but due to damage to the lighting gantry signage the event had to be called to a close early. Despite not getting to use the Mamiya C330F at Donington, I still had a good time photographing the racing at the track. 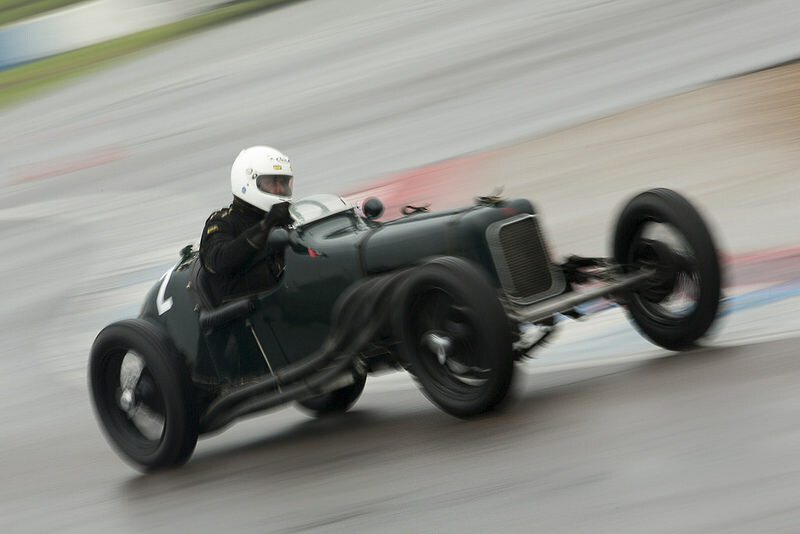 The wet conditions did make the event feel a little empty, as not many fans braved the damp conditions to see the the vintage cars racing out on track. Now that Mallory Park has has opened for business again, the VSCC could arguably return to the small track for next years race, which could provide a more suitable track for photography. More photographs can be seen in my VSCC Donington Park 2014 – Bob Gerard Memorial Trophy album on Flickr.